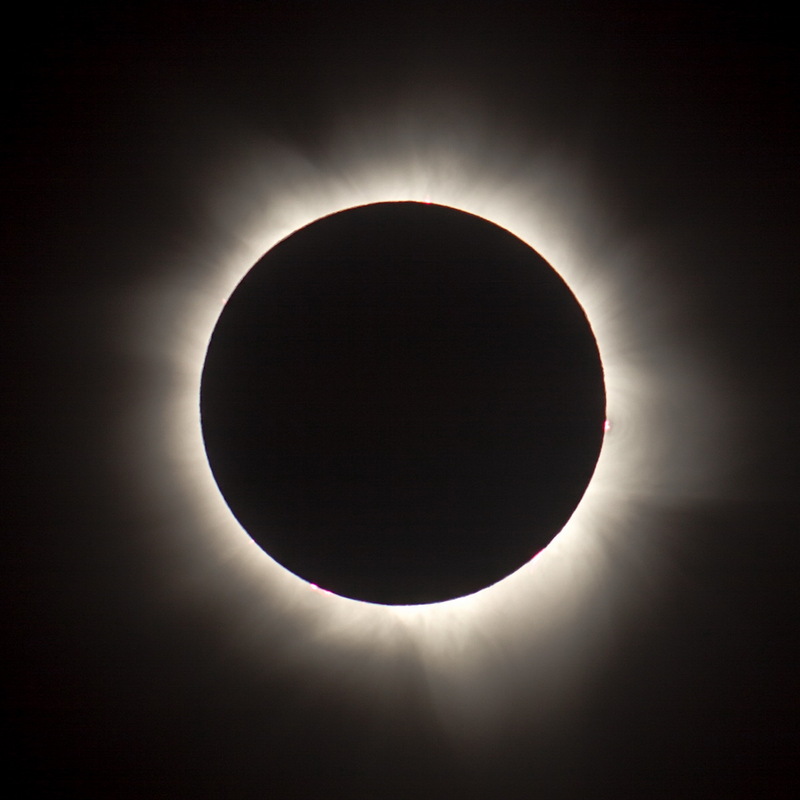 A total Eclipse of the Sun occurred in the Cairns / Port Douglas on 14 November 2102. 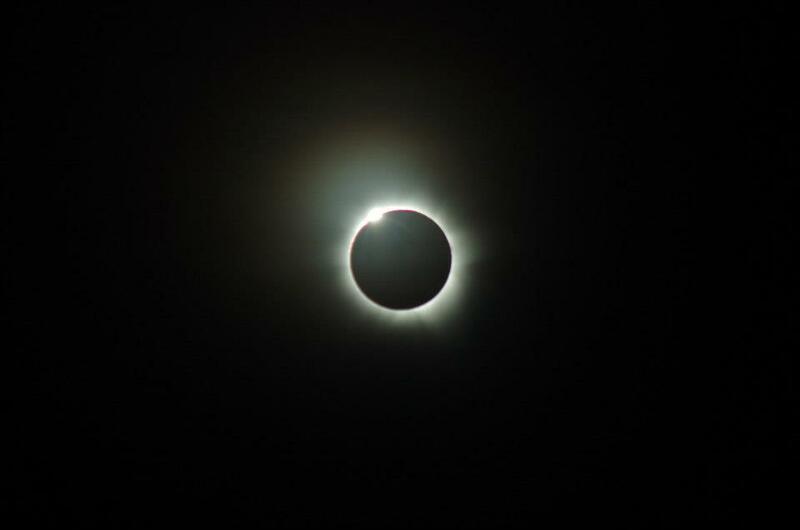 Totality lasted approximately 2 minutes. Many ASV members travelled north to experience this rare event. 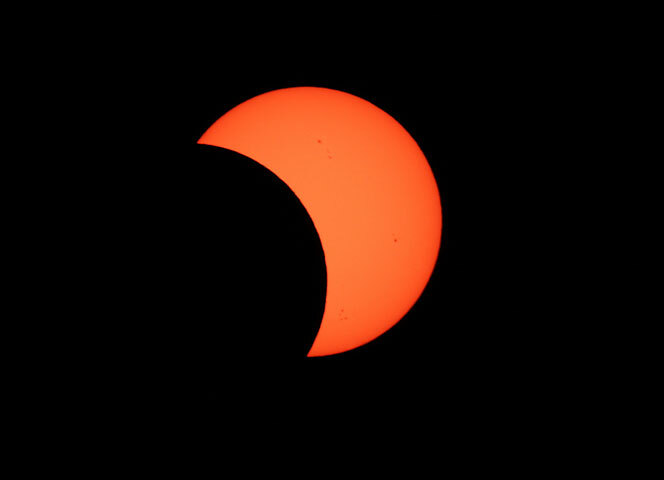 Partial eclipse were also visible from Melbourne. Below we proudly present images and stories from ASV members and our special guests. 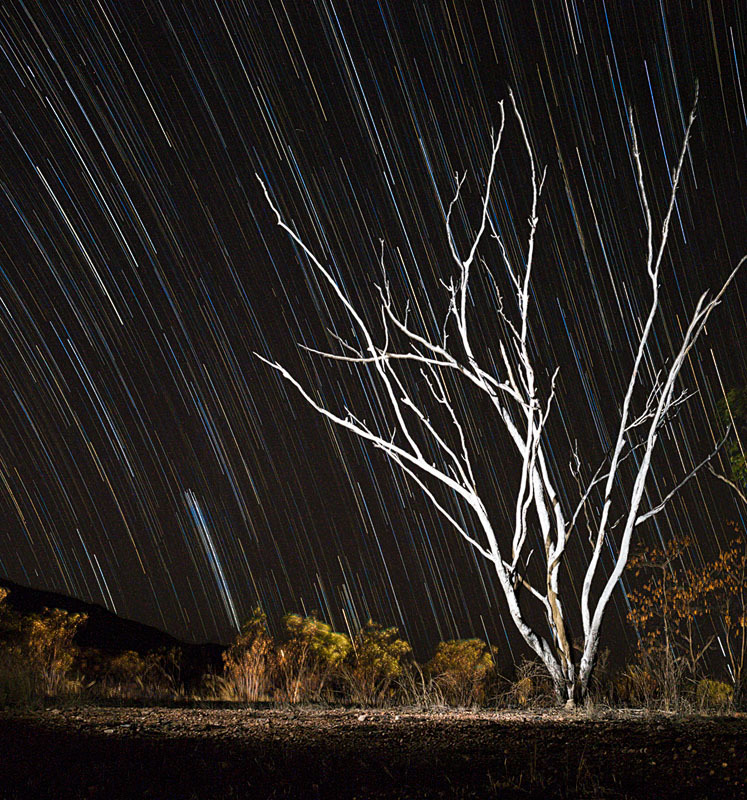 Congratulations to Phil Hart for his image that was selected as the APOD image for 15 November 2012 and to Alex Cherney for his image that was selected as the APOD on 17 November 2012. This is my attempt to capture the view of the total solar eclipse as seen from Trinity Beach in Queensland, Australia with my D90 DSLR. Our tripod wasn't usable unfortunately so this was taken resting on my knee and, as you'll see, I got distracted by totality so it wandered off target a couple of times. I stopped filming so I could try and take a still photo as it looked like we were about to get clouded out, hence stopping short. 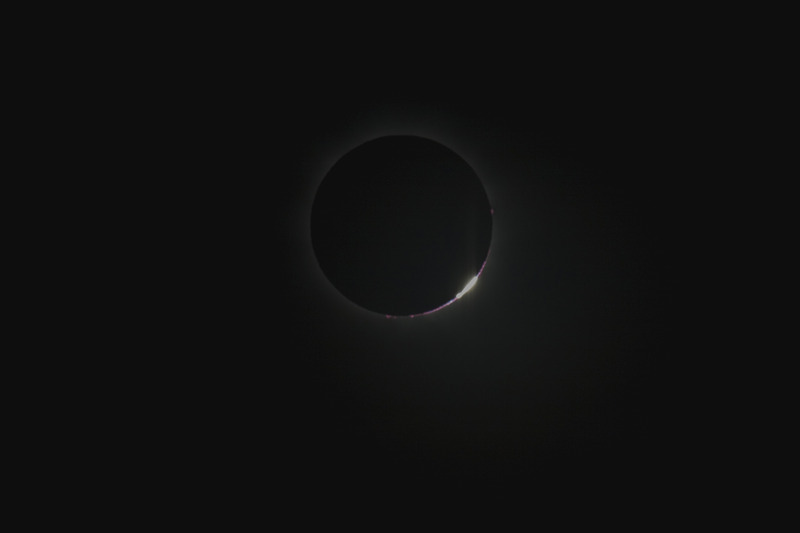 We did manage to see the diamond ring just after though! 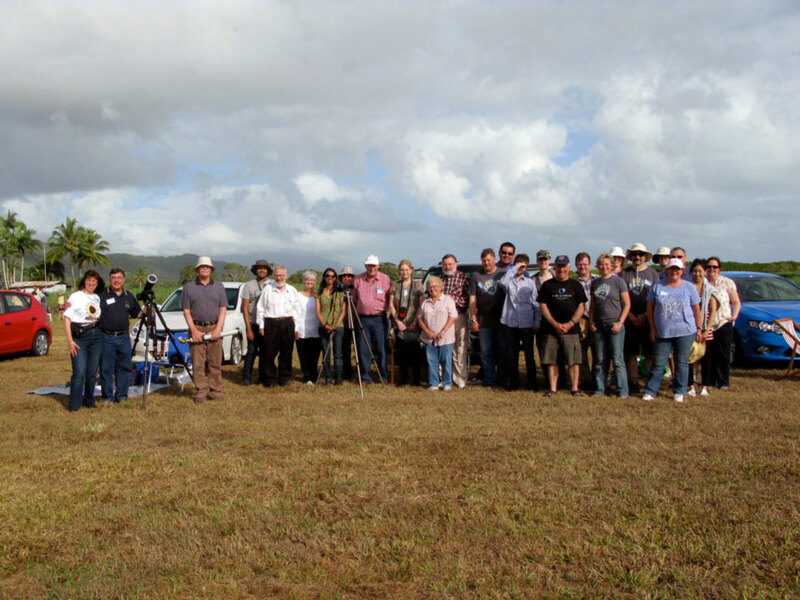 This is an ASV group photo I took shortly after the eclipse at the observing site, near the Port Douglas helicopter field. 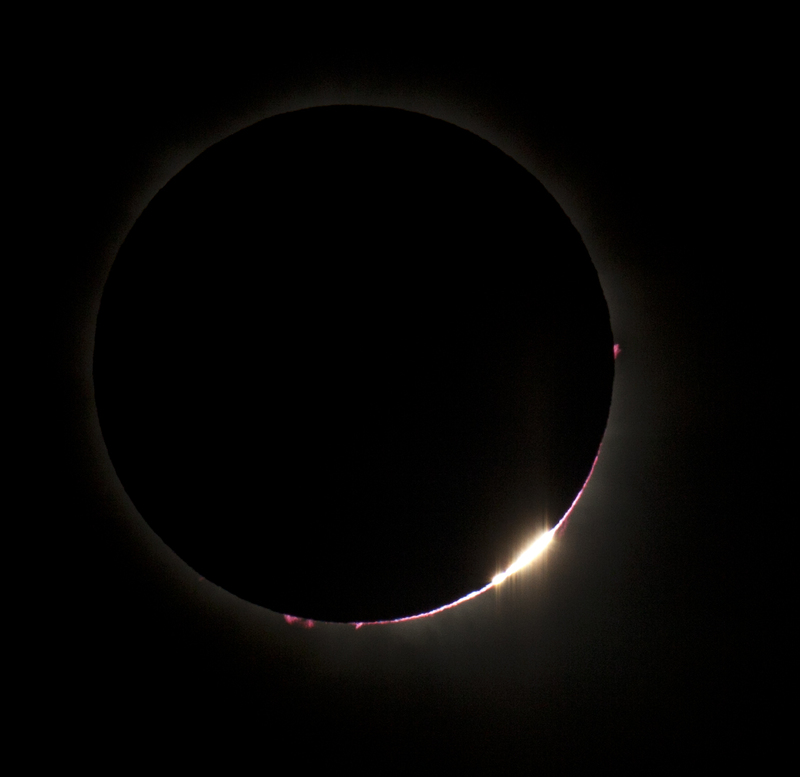 Good weather in Melbourne too; yes, lots of nice sunspots and a few good (but not especially large) prominences. It was absolutely fabulous at the eclipse. 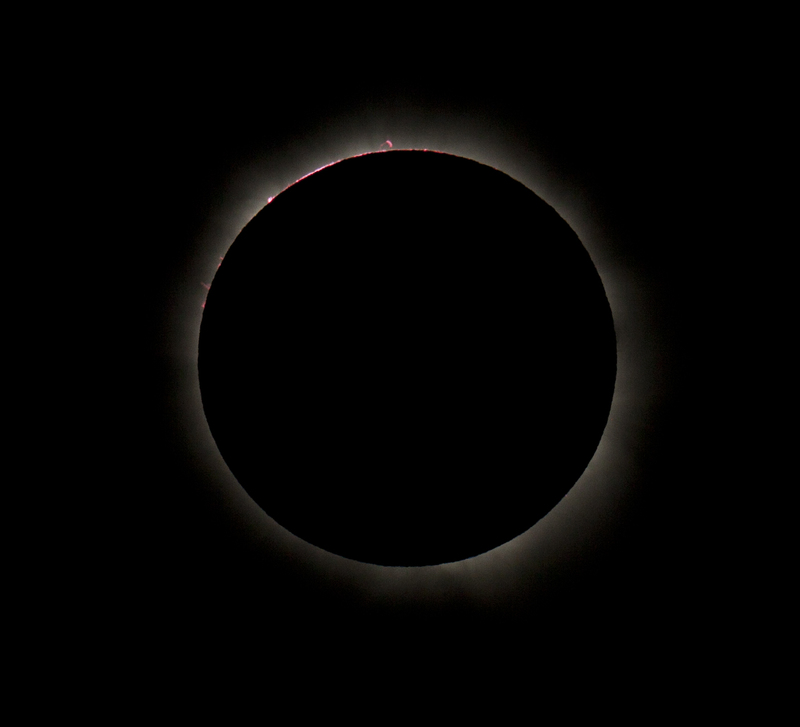 I took about 20 images of the totality and some before and some after. Here are a couple of my happy snaps. We spent 8 long hours on Monday looking for our spot, we checked the entire Mulligan highway all the way to Lakeland and back again. 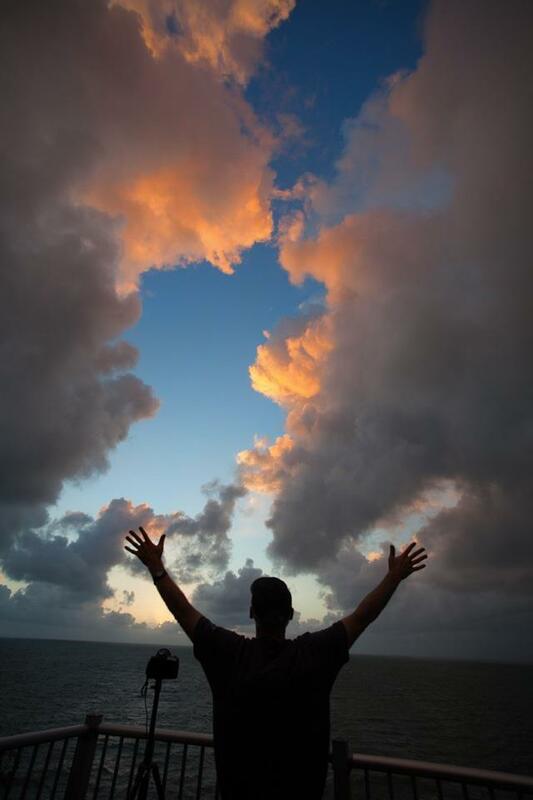 We wanted to find a spot away from the clouds on the coast. In the end, we were really was the middle of nowhere, Russell slept and snored his head off in the car and we slept out under the stars. No tent, no nothing. 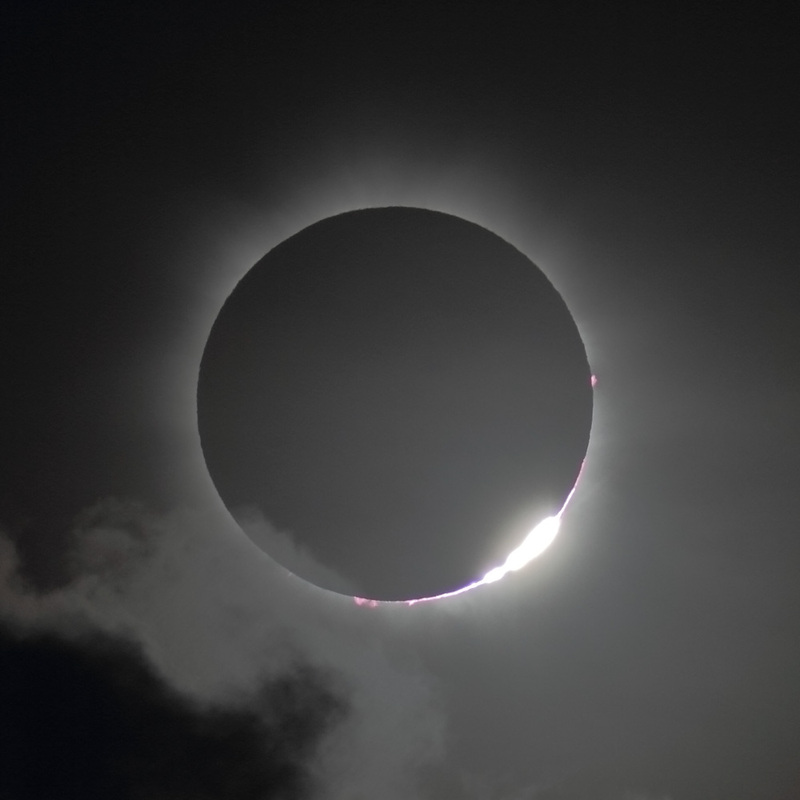 The actual eclipse was totally spellbinding - not easy to describe. As it darkened the birds started chirping and the crickets went off as well. Sadly it only lasted 2 mins and the whole show was all over by 9 the next morning. Definitely not my last eclipse. I have finally got around to sorting my images from the past two day Cairns Blitz. Was a bit of a whirlwind trip and several things needed to go my way. Firstly the equipment. My carry on luggage was just over 12 kilos (7kg limit) but got it on OK although the X-Ray guy did pause for some time. Secondly was getting a hire car, luckily the rumours about over booking weren't true (would have been pretty upset considering I booked back in March!). Rolled into Cairns, very overcast and drizzled through afternoon. I had a shower and short nap at a hotel I found with a vacancy (I was just going to sleep in the car). I awoke after a couple of hours and went for a reconnaissance drive in case the weather was poor and I decided to make a dash inland. Got back into Cairns and was welcomed by some heavy rain about 7:15. We had a very nice dinner along the Esplanade and I hit the sack around 10:30pm. Didn't sleep very well, too excited!. Woke at 2:30 even though alarm set for 3:00am. Cairns was about 90% clouded over so I thought I have come this far, I'm heading inland and hoping I get back to airport through the traffic that was predicted to be chaotic. Thirdly, the weather had to be forgiving. I drove inland to Mereeba up on the table lands and the skies started to clear. Was clearer to the NW so ended up heading further inland towards Mt Carbine. As I went further I noticed the clouds were following so kept going about 30 minutes west of Mt Carbine and stopped on the side of the road. It was about 5:15am and I meet a few people to share the experience with which was nice. The sun was to rise at ~5:30am and the sky really started brightening and the clouds lied just above the mountain range. It looked like the clouds from the coast were rising up the mountains from the east and were rolling over but weren't really moving far. the lighting started to go quite strange (only way I can describe it) about 6:15am and the birds started to chirp away then go quiet just before the eclipse. 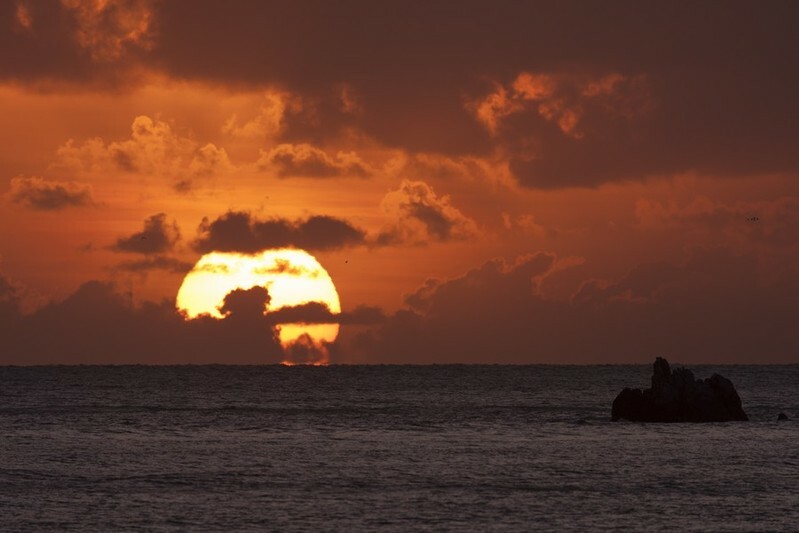 As the sun rose, it was apparent it would rise above the clouds and by 6:38am local time the eclipse would happen. There was still a fair bit of high cloud but that wasn't going to impact visually at all. 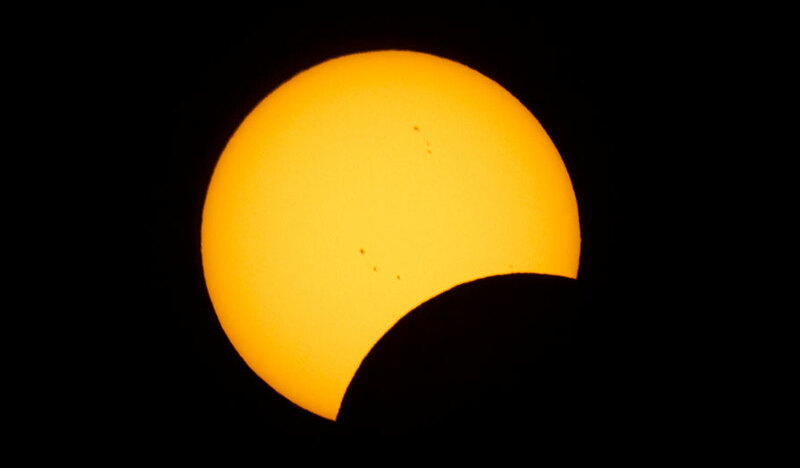 When the first sighting happened, the sun was about 30% partially eclipsed. As totality neared there were a few stray clouds starting to disperse from the main mass and started to move towards us and into the path of the sun/moon. One of these clouds actually went right through totality which was a big disappointment for my planned mosaic as it affected the corona photographically. 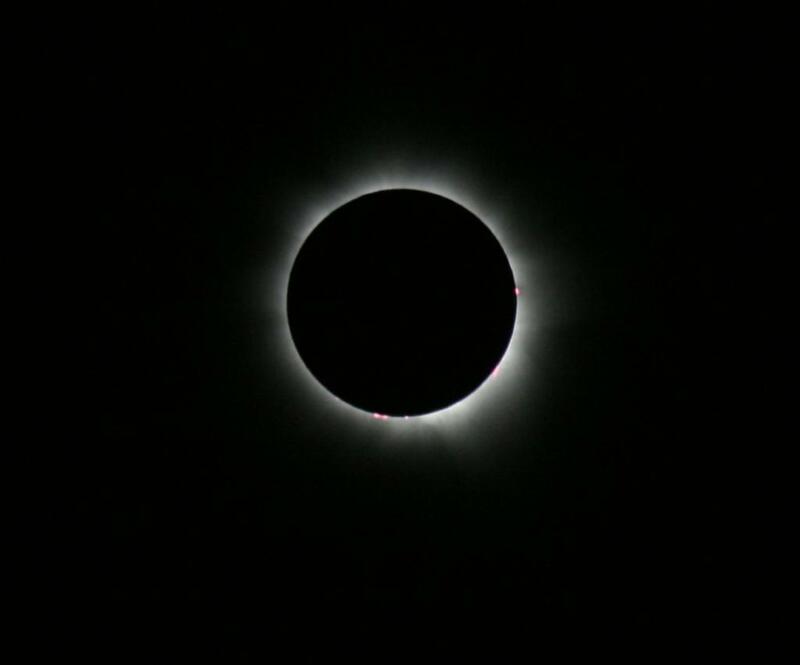 Totality was again just awesome and it can't really be described. 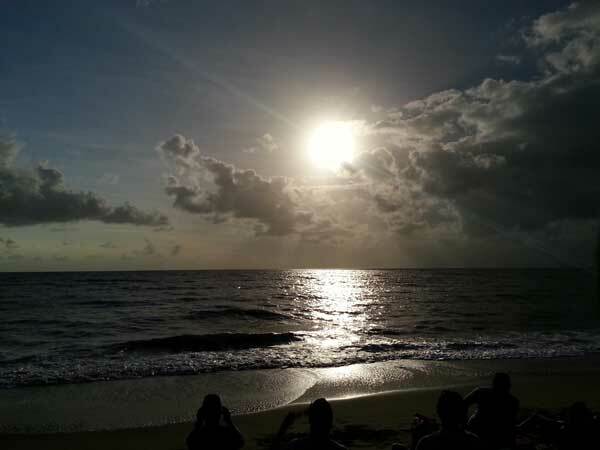 I was just so appreciative of being in the path once again and seeing it occur given many back in Cairns missed totality. This time I made time to have a quick look around at the horizon to see the sunrise affect that happened at the Libya eclipse but it wasn't as pronounced probably due the trees and the fact the sun/moon were much lower this time around. About half way through totality a truck raced past, but as he was heading east he was looking straight into the eclipse at least. Some of you may not be that interested in an eclipse to chase one, but whatever you do, if you are in the path.....STOP and have a look! Photographically I struggled and in hind-sight I should have gone through my routine more thoroughly as I struggled to get the full range of exposures I wanted due to rushing. I was changing exposures while the images were still downloading that actually prevented or slowed the changing exposures. I just ran out of time in the end. 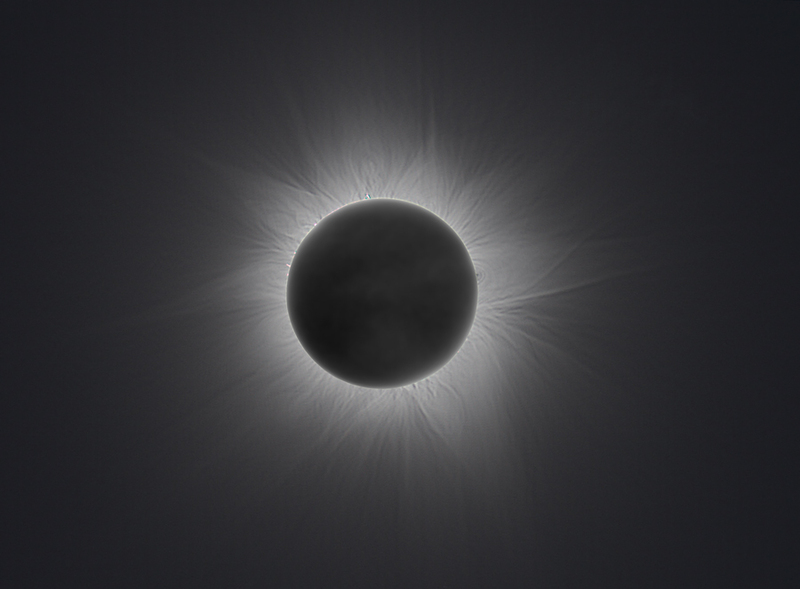 I did manage to get four images with some degree of corona variation albeit cloud affected. Anyway, back to checking out the next eclipse to chase! morning it was raining quite heavily, hopes falling, but a check out the window at 3am showed clearing skies and many stars, perhaps we might see it after all. I arrived down at the beach about 4am to see quite a collection and telescopes, cameras and tripods already set up. 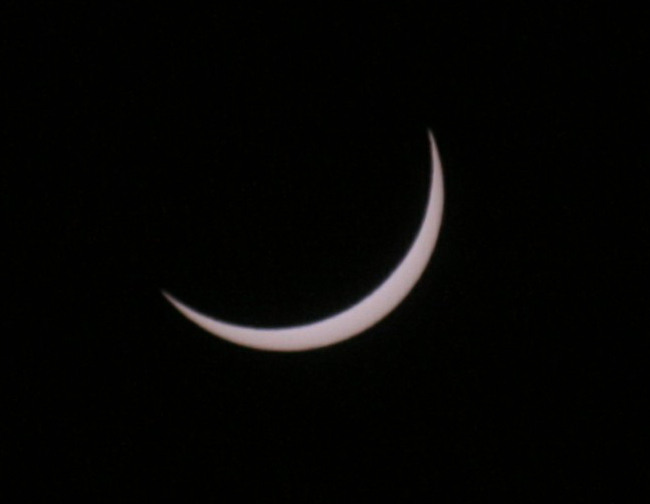 Clouds were not too bad but got some what worse as the eclipse time approached. We missed first contact but saw various partial stages and then as Alex said, the clouds moved aside for totality and we saw it! 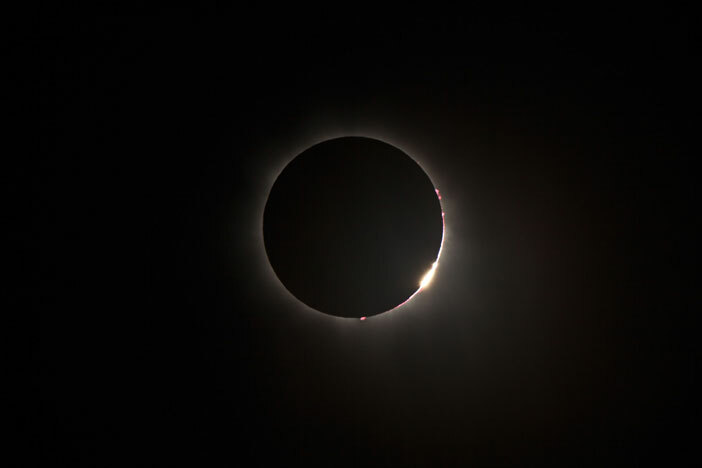 The experience with the crowd was fantastic, with cheers, clapping, oohs and aahs as the clouds moved aside and the diamond ring shone with far greater effect than I had imagined. 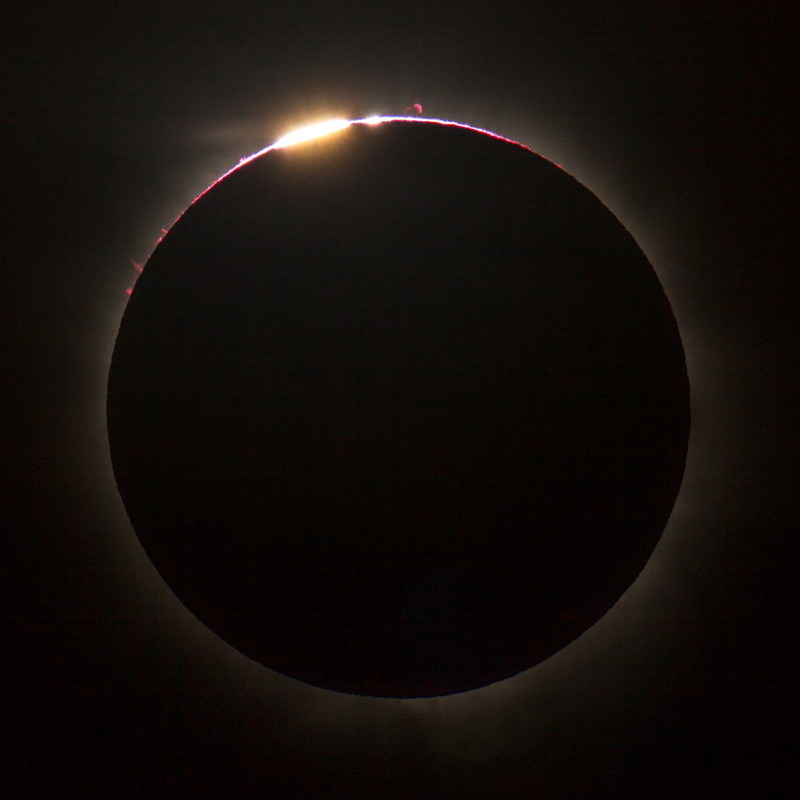 I had not seen an eclipse before and while it was the corona and prominences that I was looking out for, I will never forget this diamond ring escaping from the cloud. 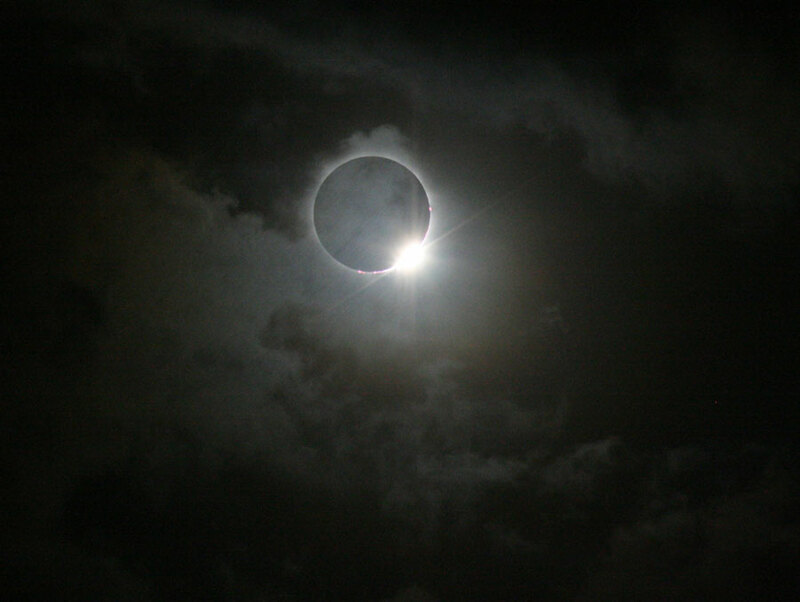 I was still shaking for a considerable time after the eclipse, it was certainly very moving. It certainly was an amazing day and I really enjoyed sharing the experience with fellow ASV members and our guests. Few shots from Clifton Beach below, what an amazing experience. My second TSE and hope it's not my last! The annular next year would be great, but it's like dancing with your sister - not the real thing! In fact NOTHING like the real thing. 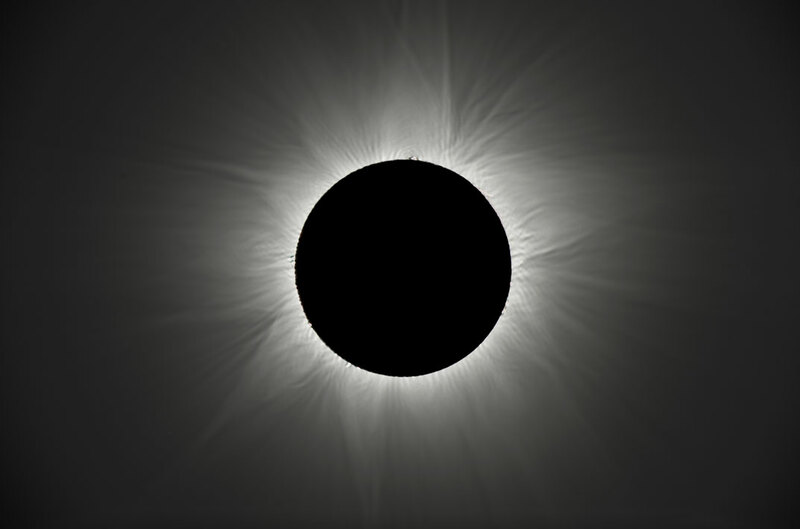 There is nothing in the astronomical viewing world even remotely equivalent to a total solar eclipse. You could roll together every great comet of history with the best meteor showers, lunar eclipses and other amazing phenomena and put them on a course of steroids that would kill every bull elephant in Africa and you still wouldn't come close to the emotional impact of a TSE in my opinion! The best photography and video footage don't even begin to convey what it's like standing under the shadow. I WANT MORE! 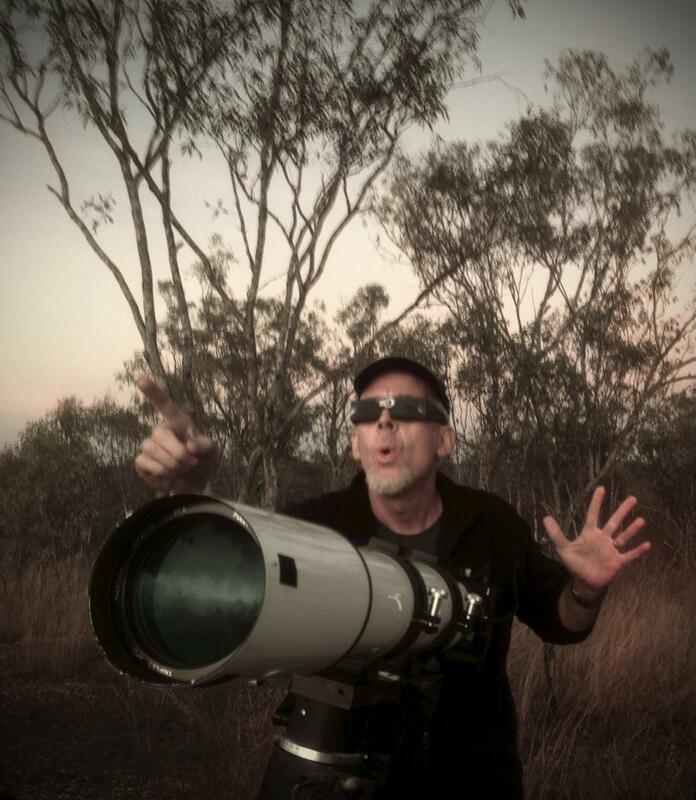 I was based in Port Douglas and was pretty much committed to viewing the eclipse from there. 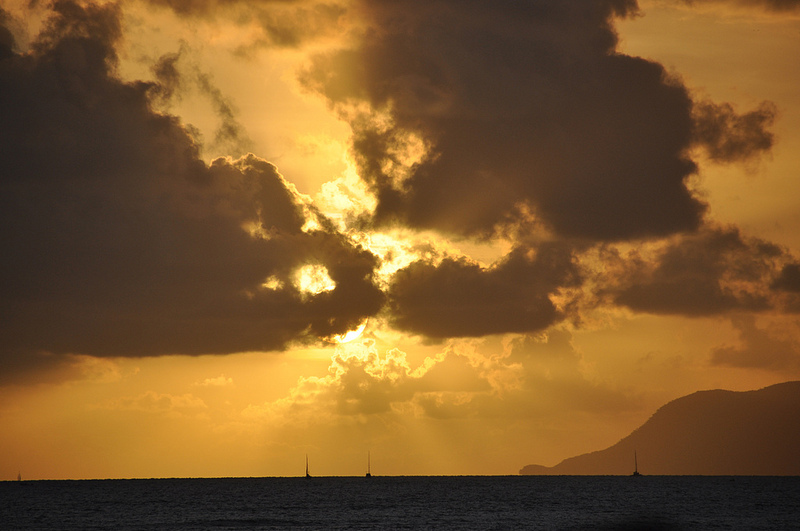 As we have all realised the chances of viewing the eclipse turned into a lottery by the cloud patterns. To improve mobility I decided to book a morning cruise on a catamaran that departed Port Douglas Marina at 05:30h with 39 other passengers and a crew of three on board - the lure of possibly having better conditions to see the eclipse off the coast and having breakfast bobbing about on the Pacific Ocean was rather attractive! As we headed out we saw the sunrise and then the sun was hidden by large thick clouds until a couple of minutes after first contact. 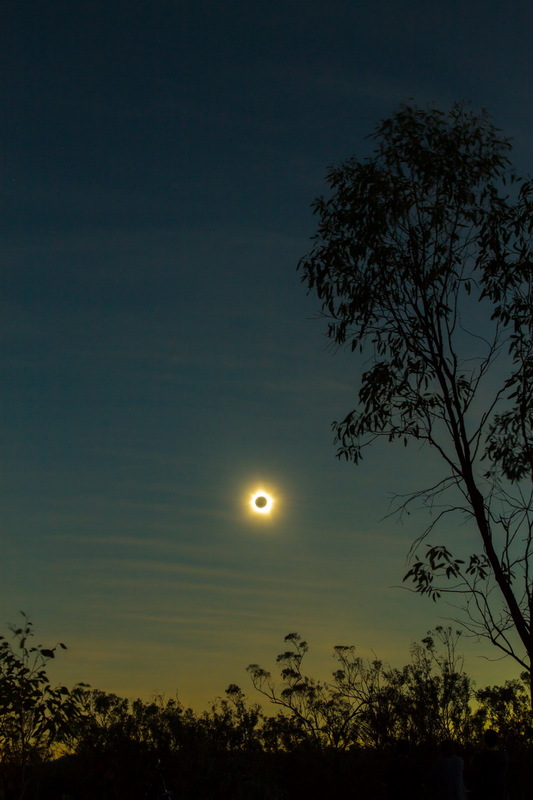 The passage of the eclipse was readily followed as the Sun made regular appearances through gaps in the cloud. We lost the Sun to the clouds five minutes before totality, missed second contact, but were aware that totality had occurred by the diminished light level and I was in awe of the beautiful pastel quality of the Moon's umbral light reflecting off the water all around us. 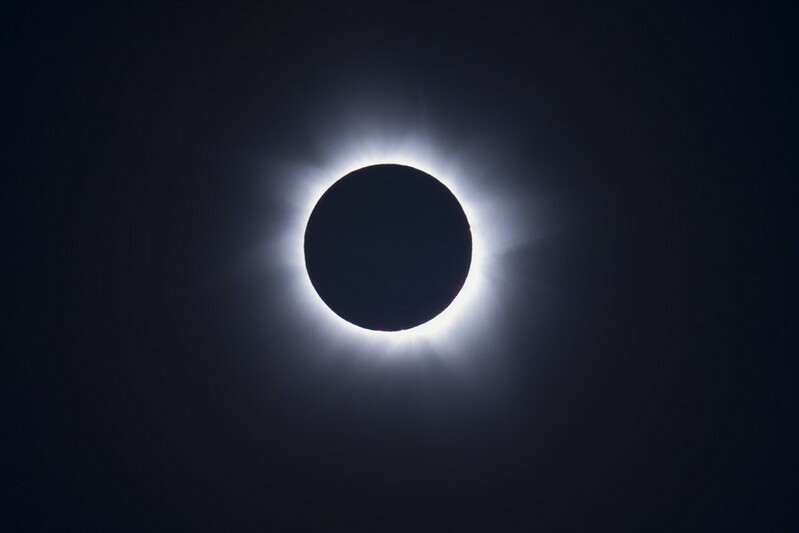 Never giving up hope that we would be rewarded, we were overjoyed when the eclipsed sun appeared in a little window of clear sky with half of totality gone. All on board erupted in cheers and clapping (and some whooping, predominantly from me)! 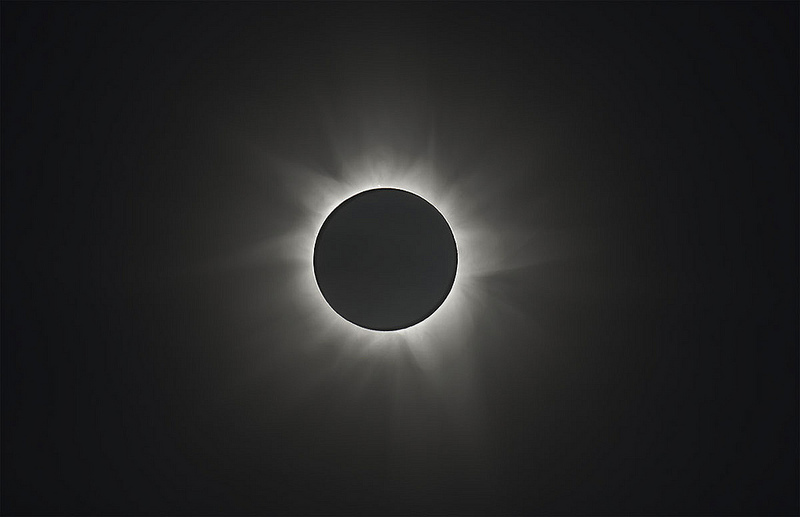 We enjoyed seeing the pure pearly white, and dazzling, light of the corona contrasting starkly with the deep blackness of the Moon's disk. Thinnish clouds moved in again moments before third contact, but it was apparent through the clouds that the diamond ring had gloriously sparkled. We next saw the sun about a minute later as a very thin crescent, then, convinced that it was all over, we retired below to tuck into the buffet breakfast. We then headed back to shore well satisfied. A memorable and totally enjoyable experience. 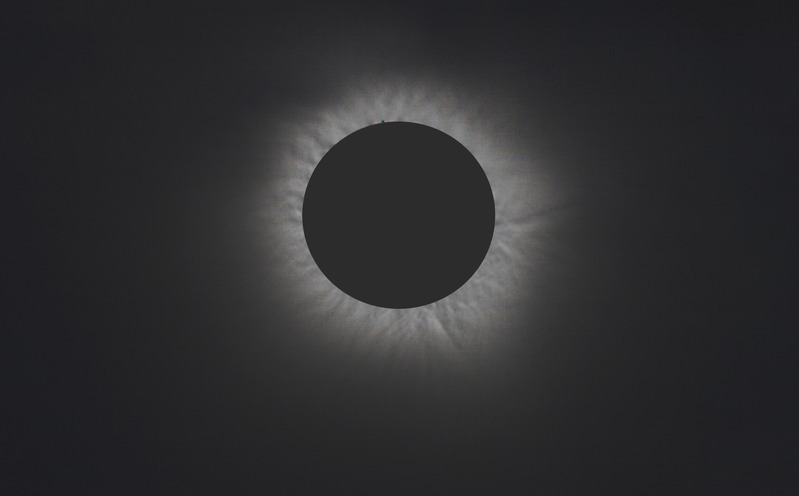 I had equipment on board to video the eclipse and, notwithstanding the roughly one meter swell seriously affecting my framing of the spectacle, this was achieved. 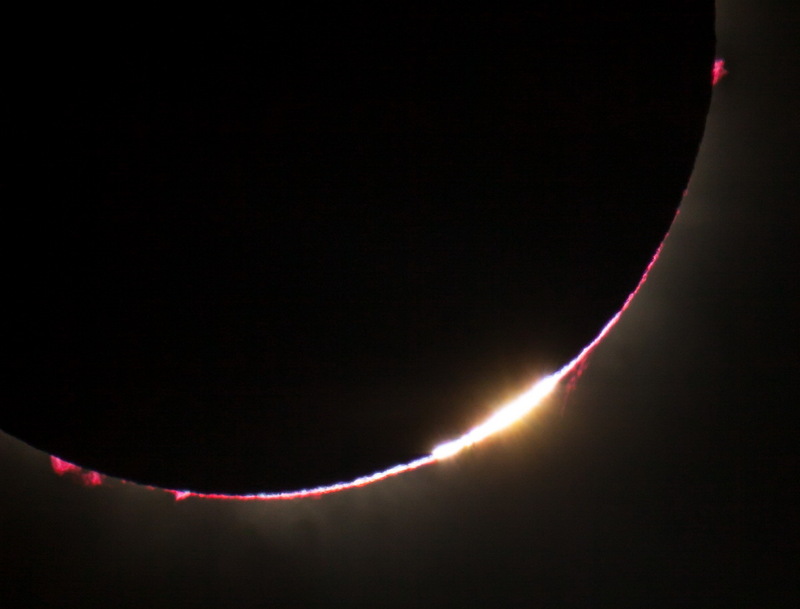 Under the prevailing conditions I discarded all notions of capturing high quality footage.....but, I actually had a lot of fun trying to keep the eclipse in the field of my full frame digital camera and 500mm prime lens (and trying to keep them on board the rocking boat)! 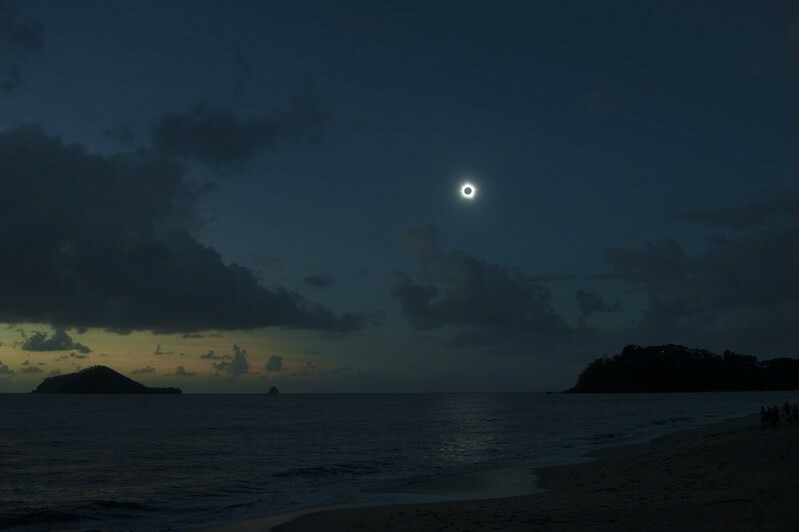 Reports from observers at Port Douglas give an indication of how fickle the wheel of fortune spins - observers at one end of Four Mile beach were clouded out at the critical time, whilst those at the other end saw all of totality. It was a tremendous, and literally moving, experience sharing an event with this select group of like-minded people that will not be repeated in Northern Queensland for a long, long time.